We just returned from 3 weeks of cruising the East and West Coast of Vancouver Island. Although we didn’t do much fishing on the east side of the Island , once we got over to the west side, fishing was the main focus. As many of you already know, some of the best salmon fishing in British Columbia takes place off the West Coast of BC. Chinook , Coho, Halibut, Ling and Snapper are all readily available. A portion of our holiday was spending some time at our new saltwater location on the West Coast. 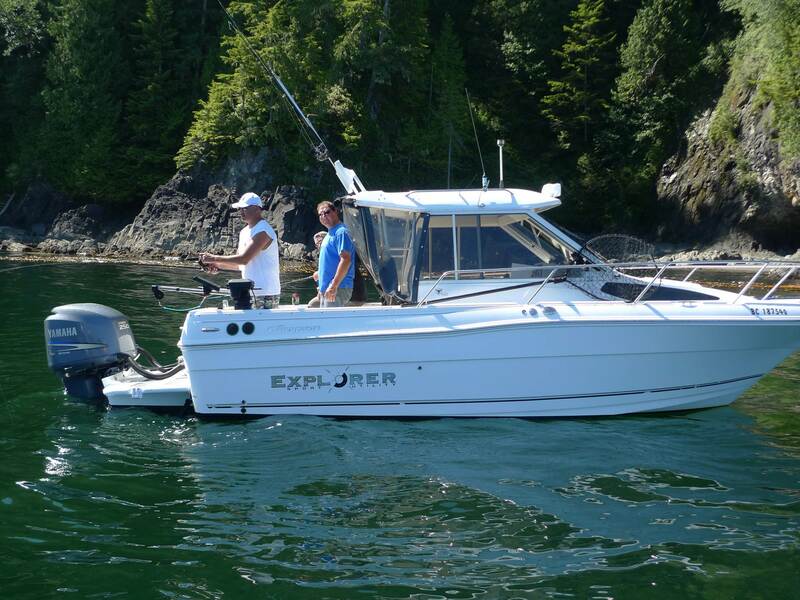 STS is now offering saltwater fishing vacations on the West Coast of Vancouver Island offering our clients an opportunity to fish some of the most productive waters in BC. If you would like more information on these charters, please give us a call or send us an e-mail. Flooding concerns for the Fraser river are now over, water is still high but is now dropping and will continue to drop throughout the summer. Larger schools of salmon are now migrating up the Fraser heading for their home waters, one of the bright spots this week was the number of sockeye returning to the Chilliwack Lake system. This run of sockeye has been building since 2000 and we are seeing some good numbers of fish returning. DFO estimates between 36,000 and 400,000 but are fairly confident that they will meet or exceed 136,000 fish. 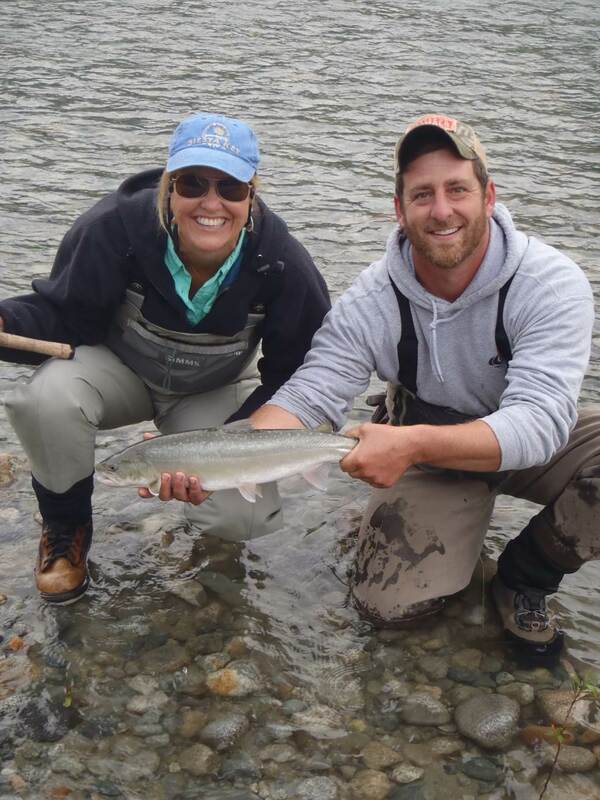 The Vedder River is still quite high but water conditions are excellent for salmon fishing. As mentioned above there are lots of sockeye in the Vedder but this fishery is not open for retention by recreational groups. All sockeye must be released unharmed so be sure you do not drag one of these fish onto shore. These sockeye will bite traditional gear used for salmon fishing on the Vedder so please do not bottom bounce with long leader. 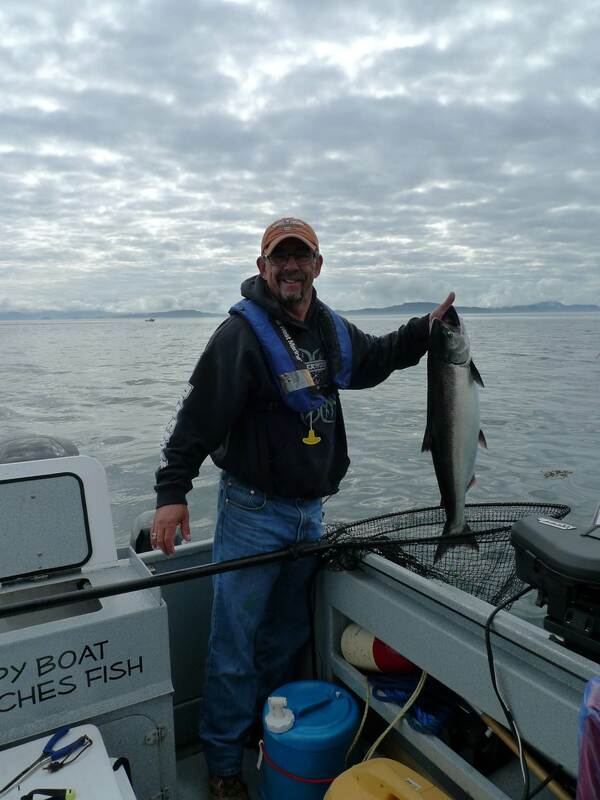 To catch sockeye on the Vedder you should be using same float fishing methods that you would use for Chinook, Steelhead or Coho. Float, weight and 16 to 20 inch leader. There are also a few Chinook being caught, look for the spotted tails before you take any salmon out of the water. The Fraser river is slowly coming into shape, water is still very high but salmon migrations are steady and on time. Good numbers of Chinook are now passing through as well as Sockeye Salmon. Although we do not expect a sockeye fishery this season, you just never know until the bulk of these fish show up in the river. Chinook fishing is open but water levels are still a bit high for salmon fishing on the Fraser. If you are wanting to catch salmon, we are currently offering salmon fishing trips targeting Fraser Chinook out of our Delta Hotel Location. The QA and Bell Buoy off the mouth of the Fraser are both beginning to produce Fraser bound fish . We are also targeting Coho heading for the Capilano River. Our West Coast Salmon trips are in full swing so if you are looking for a 2 or 3 day trip and want sore arms, we have the perfect location for you. Vic Carrao, Owner of STS Guiding with a beautiful summer Chinook Salmon. Sturgeon fishing has been fair to good this past week, Tom landed a nice 7 footer on Wednesday and I was out yesterday for a short 4 hour trip and managed to land a nice fish just over 5ft. Best Bait has been Lamprey and Eulichons. I noticed lots of fish rolling yesterday in the Hatzic area which usually means that some of the larger sturgeon are beginning to migrate back into this area. I hooked into a monster fish yesterday but didn’t manage to land it. 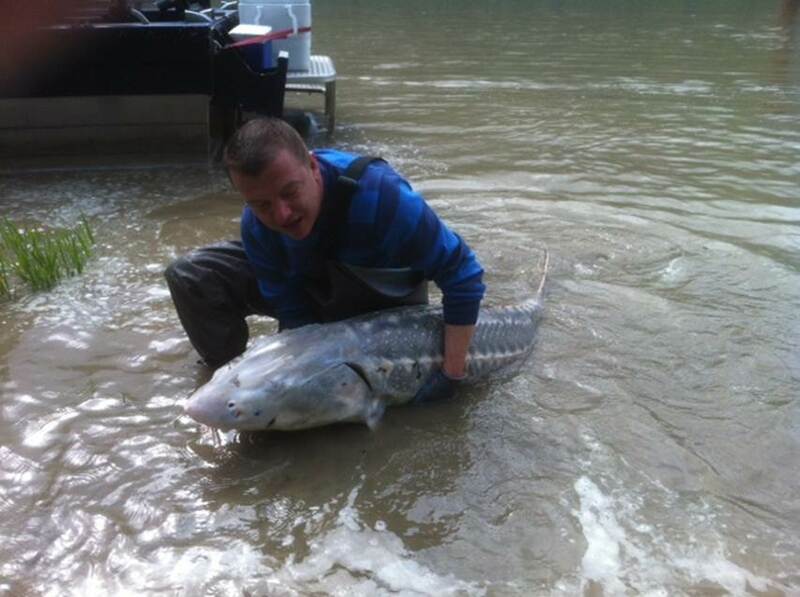 We are now into summer and sturgeon fishing should start to pick up fairly quickly. We are expecting a First Nations Salmon opening this weekend which means sturgeon will now get some good feed when fish are cleaned on the shoreline. Along with this opening means nets in the river so please watch out for FN anglers drifting nets. If you see netting activity, please avoid anchoring nearby. As mentioned above we are now targeting both Fraser Chinook and Capilano Coho. Although these fisheries are a bit inconsistent we do have some great days on the water. 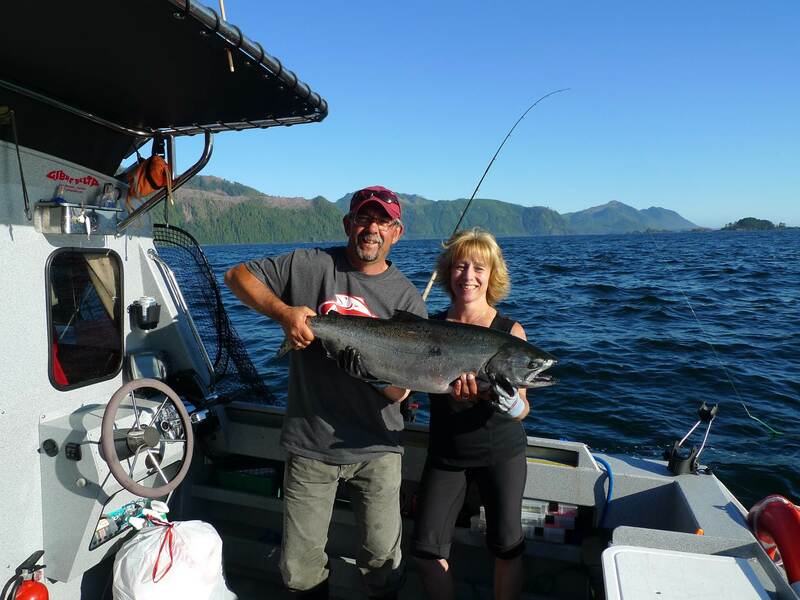 All Vancouver salmon trips depart from our Delta Airport Hotel Location which is located near the mouth of the Fraser. Just a short ride out the north arm and we are fishing the mouth of the Fraser River. Trout fishing has been fairly good this past week, all reports from Interior and local area have been encouraging. We are still offering trips into the Pitt River for sea-run trout and salmon are now beginning to make their way into the system. This river is all catch and release and offers great scenery and opportunity to view and experience the great outdoors. We will continue to offer Pitt trips through the summer until water levels become to low. August is a great month for both salmon and trout. This beauty was caught last week but one of our out of town guests. Hells Gate Jet Boat Tours. We are getting geared up for the start of our Canyon tour season, we still have some seats available for August 12 & 18, please give us a call or e-mail to book your day on the water with us. You are currently reading July 20 Report at Hells Gate Jet Boat Tours Blog.